Buying a dishwasher can mean kissing goodbye to washing up by hand. One model may look very much like another, but there are huge differences in how well they work and how long they last. When your appliance is running, does it sound like a 747 is taking off? Do soap film and spots cover up your china pattern? If so, it may be time to trade in ol‘ faithful and shop for a new unit. Today’s smart machines boast such features as ‘favourite cycle’ (which lets you pre-program your machine to automatically select options you use the most), greater loading flexibility, quieter operation and greater energy efficiency. Figures from Bosch suggest that a dish washer could save you up to 15 days every year – wouldn’t that time be better spent elsewhere? Washing by hand can be wasteful. You can get through 40 to 80 litres of water, which costs money to heat. By comparison, a dishwasher will use as little as 6 litres to wash 13 place settings. With so many machines on the market, we have rounded up and reviewed the top dish washers around to make your decision easier. We review based on energy rating, noise level, and effectiveness to bring you only the best. These are smaller than the traditional fully sized dishwashers, unsurprisingly. If you have a small kitchen or not too much space then they are perfect for you. You will however have to compromise on capacity as it probably takes around 90 to 100 items per wash. They are around 45 cm wide and so are good to fit into smaller kitchens effectively. As you can imagine these are less efficient and eco-friendly, so if you do have space then it will be better to go for the fully sized versions. With six programmes, you can get the dishes ready for a family dinner in 30 minutes while you’re busy chopping veg or remove caked-on stains without lifting a finger. This Essentials model is fast at the job too. Quick washes take half an hour, but the Super setting takes only 50 minutes to remove tough stains. A delicate setting will keep fine china and glassware sparkling without risking breakages, and there is a delayed start timer so you can work your washes around your lifestyle. We liked the adjustable hard water ability too. You’ve all seen those adverts about the build-up in dishwashers, but the automatic water softener will remove salt and minerals to keep your dishes looking clean without residue and your dishwasher working at its best for longer. The settings can be tweaked to suit your level of hard water as well. One of the downsides of dishwashers can be waiting until there is a full load. You realise you need a plate for breakfast, but they’re all in the dishwasher from last night as it is only half-full, so you need to wash by hand anyway. But with this mode, there is a half-load function. You can keep on top of the wash after every meal without wasting water or detergent. There is a salt and rinse aid top-up indicator, so you always get the top performance, and the slimline shape will fit into the most compact of free spaces. For the price, you get a highly rated dishwasher which gives you more time to do the more enjoyable things in life. Nothing says space saving quite like an integrated slimline dishwasher. This Kenwood still has a ten setting capacity, eight wash cycles and height adjustable baskets despite being compact, too. Auto Wash will deal with those everyday cleaning tasks, and there’s a Rapid Wash or Intensive option for the opposite ends of the scale. Half Load lets you deal with the dishes after every meal, so you don’t have to make do with what’s clean for dinner because they were all used at breakfast. There are a few handy loading options, too. The height adjustable top shelf and extra cutlery basket give you freedom over the way you load it up, and delay timer will allow you to clean everything when it best suits you. No more fighting for hot water when you’re in the shower. Overflow protection gives you peace of mind with the prevention of flooding, so you can leave it to get to work knowing you won’t come back to a ruined kitchen floor. An LED display keeps you in the loop with time left and settings chosen, and the rinse aid, salt and water tap not open indicators let you know when your attention is needed. There are plenty of options to suit all homes, and the fact it is slimline without restricting your washing space too much tops it all off. It doesn’t leave dishes the driest, and even though there’s plenty of space it could be better laid out, but still a great option. Despite being full-sized, this Kenwood model only consumes 11 litres of water per cycle while leaving your dishes sparkling clean. Great if you’re conscious about water usage but still want results. There are eight distinctive programs to take all of the hard work out of washing, and allow you to cater towards what is in there. From glass to china and cutlery, it will work to get them clean in the best way. You don’t even have to worry about burnt-on grime thanks to the soak and intensive programmes. We all have that dish with marks on, so they are now a thing of the past. 12 place settings gives plenty of room to get it all in in one cycle, too. The Kenwood also offers a few handy features to make cleaning even easier. There’s an LED display so you know when the cycle is done. It also comes with a delay timer, allowing you to start a load at a specific time. An A++ energy rating will keep bills low, and a quick wash can be over in 30 minutes. Its sleek design will suit any kitchen and it is the perfect addition to your family home. The Kenwood KDW60W15 is a powerful dishwasher, with the capacity to hold around 12 place settings easily. It is by far one of the most economical available with an energy rating of A++. An integrated model is one that is built into a custom kitchen. They can be put into two categories, fully integrated and semi integrated. Fully integrated models are ones that are completely hidden from view, as the front panel is covered behind a kitchen panel or door. Semi integrated options are partly covered by a kitchen cupboard door, with only the control panel visible. This type of dishwasher looks more streamlined but is harder to take with you if you ever want to move home. The Miele G4263 SCVi is a full-sized integrated model and an easy addition to our rundown of the best dishwashers. With a large capacity, it can hold up to 13 place settings in one wash. Great for keeping water and electricity usage down. A handy cutlery tray prevents these getting dropped during the cycle or scratching other items. A 24h delay start gives you control over when it operates, and a countdown indicator lets you know when it is finished. Why not take advantage of lower off-peak electricity costs or have your dishes ready when you get home from work? Because it is fully integrated, the Miele will either be hidden from view by a cupboard door or sit visible yet flush with your cupboards. We loved the automatic programme, which sensed the weight and capacity to tailor the perfect settings on our behalf. The Miele is astonishingly quiet at 46dB and economical with its A+ energy rating score. It still delivers powerful cleaning capabilities and drying results, leaving you with streak free dishes. 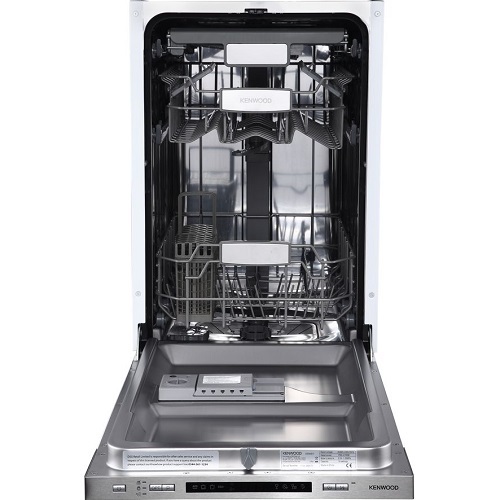 If you are looking for a fully integrated dishwasher for your whole family then this is one of top models currently on the market. Thirteen place settings, four programmes and a pre-wash feature make this dishwasher a standout buy. We expected no less from Indesit, one of the leading kitchen appliance brands. The four programme modes are Eco, Intensive, Normal and Pre-wash. So, no matter the state of your dishes or the amount of water and energy you use, there is a solid option. The top and bottom racks are adjustable if you need to accommodate larger pots and pans. Cutlery is kept safe and contained in the dedicated basket so nothing will get damaged or scratched. A natural drying system dries the contents effectively which is great, as some can leave them a bit dry and add far too much time on to the end of the cycle. Anti-flood precautions will cut the water supply off if there is an issue. You won’t pop the dishwasher on when you’re out and come back to a kitchen which resembles a huge puddle. An A+ rating keeps costs low on every setting, and you won’t use any more water or power than necessary. Overall, everything came out clean and sparkling if appropriate. It is nice and quiet, and there’s plenty of room for the plates of even the more hectic families. There are no little extras like a time left indicator, delay timer or rinse aid/salt indicators, but the actual aim is completed effectively. 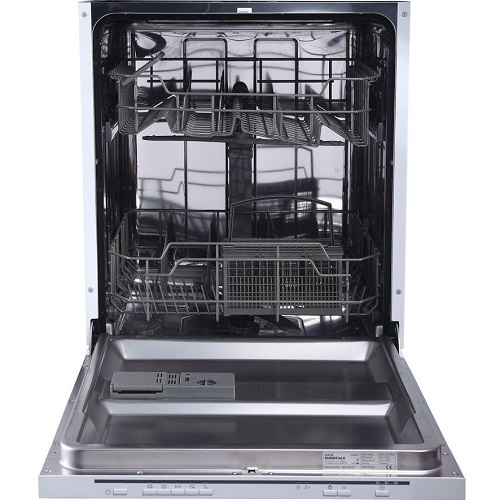 A dishwasher which will seamlessly fit into your lifestyle, this Essentials appliance is easy to use and does the job. A rapid wash setting will have the contents clean in 30 minutes, which is ideal if you need some extra plates and cutlery for last-minute guests at short notice. There are four other washing programmes too, including an intensive setting for those trickier washes and an Eco setting. The latter takes 190 mins to complete, which is faster than a lot of others on the market if this will be the setting you stick with. Because it is rated A++ for efficiency, all programmes will be economical to run and keep both bills and usage in check. A delay start timer gives you even more control, so you can leave it to run when you’re out or overnight and ready for the morning. Rinse aid and salt indicators will let you know when either needs topping up, and a digital LED indicator will also give you essential information such as timings and the settings chosen. The dishes at the end aren’t the driest, and the racks are slightly flimsy feeling and a bit hard to load because of the layout and style. Plates and cutlery are fine, but anything more complicated than this can start to become cumbersome. The door also won’t stay open unless you pull out the lower shelf so beware when stacking, and also be aware that this means you can’t really let air in to dry the dishes. Having said this, the price makes it one of the more budget-friendly on the market, especially for the 12 place setting capacity. Giving you the chance to keep on top of the dishes and help keep your bills down at the same time, this Beko model is a great built-in option. There is a 30-minute fast programme if you suddenly realise that you don’t have enough plates for dinner. A more thorough setting takes only 58 minutes, so can be done by the time you’ve caught up on the latest episode of that new TV drama everyone is talking about. Gone are the days you’d have to wait for the dishwasher to be crammed full to start a wash, too. A half load function will immediately deal with the Saturday morning breakfast dishes so they’re ready for dinner, or if you’re just cooking for yourself you don’t have to keep them in there for hours. It uses less water and energy in accordance to the lower load, so still is cost-effective. As the energy rating is A+, even a full load on the most demanding setting won’t cost a lot to run. Not only are you being kind to your purse, but also the environment. It is quiet on all settings, and an indicator lets you know how much time is left in the cycle. We will say the instructions for fitting look a little too simple to get to grips with so we would recommend getting someone to fit it if you don’t know where to begin, but aside from this, it is simple to use and compared to hand washing, will save you money in the long run. A freestanding model simply means that it is built into your kitchen. Generally, they will fit into every kind of kitchen, as long as they allow for it. The front door is designed to be completely visible when fitted in your kitchen. Because these machines are really common it’s easy to find one that fits your budget and they are also a lot smaller and can fit into snug spaces. If you ever decide to move house, then you can take your dishwasher with you. 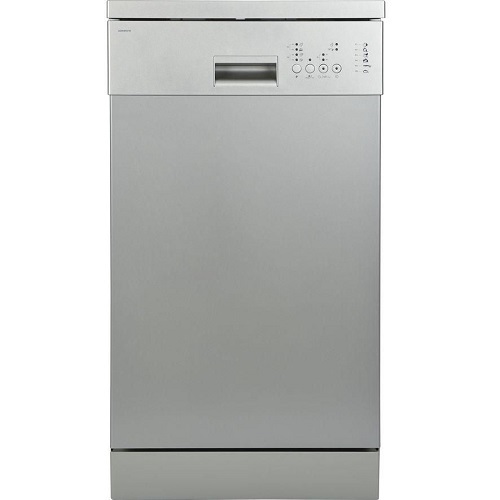 The Bosch SMS24AW01G is one of the top freestanding dishwashers available. It fits into even the busiest of lifestyles seamlessly with its sleek design and snazzy features. Energy efficient with a rating of A+, it won’t drain your energy bill dry. With the capacity to hold 12 place settings and four wash programs, the Bosch keeps your crockery clean and safe. A quick wash 45c cycle washes lightly soiled dishes in just 29 minutes. Dosageassist also breaks down your detergent for the best performance. With multiple technologies and a cutlery basket, the Bosch freestanding dishwasher is great for any home. Though it offers undeniable power and cleaning ability, it lacks some of the more luxury features like delay start, digital display and child lock. With this in mind, it is still one of our top freestanding machines. Plus it is available in both white and black so you’re not stuck for choice. An easy to use yet highly effective freestanding dishwasher with a reasonable price tag. In order to get the best out of your dishwasher, you are going to need a host of programme options to suit your lifestyle and cooking habits. This Beko model offers five, so whether you have lightly soiled dishes or full on grease and grime to tackle, you’ll never use more water or time than is necessary. The Mini 30′ programme is great for plates and cutlery which have just been used to eat or prepare food. A Quick and Shine function will deal with tougher issues in just under an hour. If you’ve only got half a load, simply select the appropriate setting, or if there is burnt on sauces in lasagne or casserole dishes select the Clean and Shine programme for a sparkling set of bakeware in 90 minutes. There is a 13 place setting capacity so all of the dishes from the day can be cleaned in one go while you’re sitting down watching the soaps. The cup rack and cutlery basket keep precious items safe but also are removable if you need to cater for bigger items. Thanks to the high energy rating, it doesn’t cost the earth to run. You’ll save money on your bills versus washing by hand, and you’ll also help the planet by using less water. Giving yourself an easier life has never been so appealing. Dishwashers are a must for some homes, but for others they’d be a luxury. There is simply no space to accommodate one. However, this Zanussi is compact enough to make you rethink. It holds around 6 place settings with a water consumption of 6.5 litres per cycle, which should be plenty to get the after-dinner dishes cleaned. With an A+ energy rating, it isn’t going to cost the earth to keep going. It has short but effective cycles making it a great way to keep up with dirty dishes. It offers a 20-minute party program, as well as eco 55 minute, glass 40 minute and intensive 70 minute washes for versatility and powerful cleaning. The LED time indicator will let you know how long you have left on a wash, in case you need to reload. It also comes with adjustable prongs and cutlery basket to load bigger items and make the most of the space. Beware of the limitations as it is so compact – it can’t take many pots and pans for instance – but it is still a great price. The Zanussi ZDM17301SA is a compact, table top appliance that is great for those with less space. Before you buy a new dishwasher there are a couple of things you need to consider. You need to think about the type of dishwasher you want for your home, and how much space you have free. Most importantly, you need to make sure your dishwasher can be connected to a water source, outlet, and power source. Once these have been identified then you are good to go. Before you start shopping around for your new dishwasher, there are a number different types to choose from. To help you decide which dishwasher will be right for you, we have set out the different types of dishwashers available and included a detailed description of handy features to look out for. These hold around 12 place settings and are the most common type available. Approximately they hold around 120-150 items and measure 60 cm wide. Some of the biggest models can actually hold around 150 items at a time. These are great for saving water and efficiency as many items can be washed at the same time, without having to use numerous cycles. These are more commonly known as top dishwashers because they are small and compact enough to be placed on a kitchen surface. They have a significantly smaller capacity than the fully sized dishwasher and hold around 40 to 60 items per cycle. They measure in at around 55cm wide but are very compact. These tend to use a lot more water and electricity and so are the least energy efficient on the list. This is a very good feature to have, especially if you have young children in the house. This means that they are not able to change any settings or open the door at a bad time. This enables the machine to determine how dirty the dishes and water are in the machine and to alter the heat and length of the wash accordingly. This saves you having to alter everything or having to bring them out when they’re still dirty. This is a handy feature on any dishwasher machine because it makes loading bigger items easy. Say you have some tall glasses or a casserole dish, you can make it fit easier. Most dishwashers come with this feature and it means that you are able to program the time you want the machine to start working. You can set it hours before you want it to start, as most have a standard 24 hour preset. To soften water and help detergent clean your dishes effectively. Elements inside your dishwasher can become blocked with limescale if you don’t use salt, especially in hard water areas. Dishwasher salt ultimately helps your dishwasher last longer and wash more effectively. Reduces drying times and saves you money on your electricity bill. It leaves dishes shiny and streak free. Detergent is the cleaning agent that washes your dishes. They come in the form of a powder, tablet or liquid and are inserted into the machine before every wash. This is important to keep your dishwasher fresh and grease-free. You can’t wash dirty dishes in a dirty dishwasher or it will be ineffective. It’s important to periodically spruce up your dishwasher with cleaner. This provides a fragrant scent when the dishwasher door is opened. It is not essential but gets rid of bad odours. Are Dishwashers Expensive To Run? This depends on the type and model you buy. Many of them have a different energy consumption level and this determines how efficient they are on water and energy consumption and in turn, how economical it will be in your home. Take a look at the different energy bands here. Why Do I Need To Buy Dishwasher Salt? Salt is needed to soften the water in the machine. It is especially essential if you have hard water because it tends to have a lot of lime scale and minerals in the water. That can build up on the elements and cause it to break. Using salt softens the water so this doesn’t happen and also makes the detergent to work more effectively. What Models Have Heated Drying? There are many different models that offer heated drying. It means that after your dishwashing cycle has finished, the dishwasher will heat up and dry all your dishes, making them more shiny and streak free. Are Any Connected To Hot Water? This really depends on the model you decide to purchase. Most are connected to a cold water supply and this is heated up in the machine. There is much debate about whether they can use hot water but it is still unclear and it doesn’t seem to be a simple yes or no answer.